This page is about the city of Cape May. For other uses, see Cape May (disambiguation). 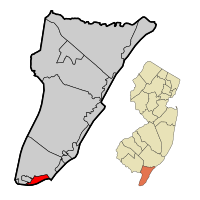 Cape May City highlighted in Cape May County. Inset map: Cape May County highlighted in the State of New Jersey. Cape May is a city at the southern tip of Cape May Peninsula in Cape May County, New Jersey, where the Delaware Bay meets the Atlantic Ocean. One of the country's oldest vacation resort destinations, it is part of the Ocean City Metropolitan Statistical Area. As of the 2010 United States Census, the city had a year-round population of 3,607, reflecting a decline of 427 (-10.6%) from the 4,034 counted in the 2000 Census, which had in turn declined by 634 (-13.6%) from the 4,668 counted in the 1990 Census. In the summer, Cape May's population is expanded by as many as 40,000 to 50,000 visitors. The entire city of Cape May is designated the Cape May Historic District, a National Historic Landmark due to its concentration of Victorian buildings. With a rich history, award-winning beaches, designation as a top birdwatching location, and many examples of Victorian architecture, Cape May is a seaside resort drawing visitors from around the world. Cape May was recognized as one of America's top 10 beaches by the Travel Channel and its beach was ranked fifth in New Jersey in the 2008 Top 10 Beaches Contest sponsored by the New Jersey Marine Sciences Consortium. The city was named for 1620 Dutch captain Cornelius Jacobsen Mey who explored and charted the area between 1611–1614, and established a claim for the province of New Netherland. It was later settled by New Englanders from the New Haven Colony. What is now Cape May was originally formed as the borough of Cape Island by an act of the New Jersey Legislature on March 8, 1848, from portions of Lower Township. 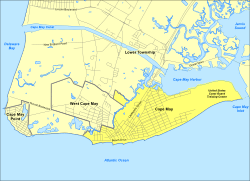 It was reincorporated as Cape Island City on March 10, 1851, and finally became Cape May City as of March 9, 1869. Cape May began hosting vacationers from Philadelphia in the mid 18th century and is recognized as the country's oldest seaside resort. It became increasingly popular in the 18th century and was considered one of the finest resorts in America by the 19th century. In 1878 a five-day-long fire destroyed square blocks of the town center and as part of the reconstruction efforts replacement homes were almost uniformly of Victorian style. As a result of this and of more recent preservation efforts, Cape May is noted for its large number of well-maintained Victorian houses — the second largest collection of such homes in the nation after San Francisco. In 1976, the entire city of Cape May was officially designated a National Historic Landmark as the Cape May Historic District, making Cape May the only city in the United States wholly designated as such. That designation is intended to ensure the architectural preservation of these buildings. Because of the World War II submarine threat off the East Coast of the United States, especially off the shore of Cape May and at the mouth of the Delaware Bay, numerous United States Navy facilities were located here in order to protect American coastal shipping. Cape May Naval facilities, listed below, provided significant help in reducing the number of ships and crew members lost at sea. 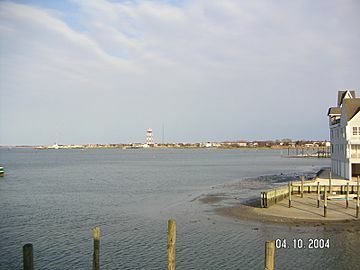 Cape May Harbor as seen from Devil's Reach. According to the United States Census Bureau, the city had a total area of 2.743 square miles (7.103 km2), including 2.404 square miles (6.226 km2) of land and 0.339 square miles (0.877 km2) of water (12.35%). Cape May is generally low-lying; its highest point, at the intersection of Washington and Jackson Streets, is 14 feet (4.3 m) above sea level. Unincorporated communities, localities and place names located partially or completely within the city include Poverty Beach. Cape May borders West Cape May Borough, Lower Township, the Atlantic Ocean, and the Delaware Bay. The Cape May-Lewes Ferry provides transportation across the Delaware Bay to Lewes, Delaware. Cape May Harbor, which borders Lower Township and nearby Wildwood Crest allows fishing vessels to enter from the Atlantic Ocean, was created as of 1911, after years of dredging completed the harbor which covers 500 acres (200 ha). Cape May Harbor Fest celebrates life in and around the harbor, with the 2011 event commemorating the 100th anniversary of the harbor's creation. Cape May is the southernmost point in New Jersey; it is at approximately the same latitude as Washington, D.C. According to the Köppen climate classification system, Cape May has a humid subtropical climate (Cfa), typical of coastal New Jersey, with hot, humid summers and cool winters. A panorama of Cape May Harbor. Precipitation is distributed fairly evenly throughout the year. Being the southernmost point in New Jersey, Cape May has fairly mild wintertime temperatures, with a January daily average temperature of 35.1 °F (1.7 °C). Conversely, summer sees less extreme heat than in most places in the state, making the town a popular place to escape the heat; on average there are only 12 days of 90 °F (32 °C)+ temperatures. Snowfall averages 15.7 inches (39.9 cm) per season, mostly from December to February. Extremes in temperature have ranged from −2 °F (−19 °C) on January 17, 1982 up to 106 °F (41 °C) on July 7, 1966; since 1894, sub-0 °F (−18 °C) have occurred only four times and 100 °F (38 °C)+ only seven times. Cape May is in USDA hardiness zone 7b/8a, similar to parts of coastal Maryland, making it a suitable location to grow traditional northeastern plants including English yew, boxwoods, and sugar maples. Because of the warmer wintertime temperatures, Hardy Palms including Trachycarpus fortunei (Chinese Windmill Palm) and Needle Palms work quite well in the landscape. Wine grapes also do particularly well, given the long growing season. As of the census of 2010, there were 3,607 people, 1,457 households, and 782.4 families residing in the city. The population density was 1,500.6 per square mile (579.4/km2). There were 4,155 housing units at an average density of 1,728.5 per square mile (667.4/km2)*. The racial makeup of the city was 89.05% (3,212) White, 4.85% (175) Black or African American, 0.30% (11) Native American, 0.67% (24) Asian, 0.11% (4) Pacific Islander, 2.30% (83) from other races, and 2.72% (98) from two or more races. [[Hispanic (U.S. Census)|Hispanic or Latino of any race were 8.62% (311) of the population. There were 1,457 households out of which 16.3% had children under the age of 18 living with them, 44.6% were married couples living together, 7.5% had a female householder with no husband present, and 46.3% were non-families. 42.0% of all households were made up of individuals, and 27.9% had someone living alone who was 65 years of age or older. The average household size was 1.95 and the average family size was 2.64. In the city, the population was spread out with 12.8% under the age of 18, 20.6% from 18 to 24, 18.6% from 25 to 44, 20.3% from 45 to 64, and 27.6% who were 65 years of age or older. The median age was 42.2 years. For every 100 females there were 104.7 males. For every 100 females ages 18 and old there were 107.4 males. The Census Bureau's 2006-2010 American Community Survey showed that (in 2010 inflation-adjusted dollars) median household income was $35,660 (with a margin of error of +/- $4,248) and the median family income was $50,846 (+/- $16,315). Males had a median income of $43,015 (+/- $20,953) versus $31,630 (+/- $22,691) for females. The per capita income for the city was $30,046 (+/- $4,010). About 2.2% of families and 4.8% of the population were below the poverty line, including 5.1% of those under age 18 and 7.1% of those age 65 or over. As of the 2000 United States Census there were 4,034 people, 1,821 households, and 1,034 families residing in the city. The population density was 1,623.7 people per square mile (628.0/km2). There were 4,064 housing units at an average density of 1,635.7 per square mile (632.7/km2). The racial makeup of the city was 91.32% White, 5.26% African American, 0.20% Native American, 0.40% Asian, 0.05% Pacific Islander, 1.26% from other races, and 1.51% from two or more races. Hispanic or Latino of any race were 3.79% of the population. There were 1,821 households out of which 18.0% had children under the age of 18 living with them, 47.6% were married couples living together, 7.0% had a female householder with no husband present, and 43.2% were non-families. 39.4% of all households were made up of individuals and 24.2% had someone living alone who was 65 years of age or older. The average household size was 2.02 and the average family size was 2.69. In the city the population was spread out with 16.3% under the age of 18, 11.5% from 18 to 24, 19.8% from 25 to 44, 23.9% from 45 to 64, and 28.5% who were 65 years of age or older. The median age was 47 years. For every 100 females there were 97.1 males. For every 100 females age 18 and over, there were 94.5 males. The median income for a household in the city was $33,462, and the median income for a family was $46,250. Males had a median income of $29,194 versus $25,842 for females. The per capita income for the city was $29,902. About 7.7% of families and 9.1% of the population were below the poverty line, including 7.0% of those under age 18 and 10.9% of those age 65 or over. Emlen Physick Estate (1879), Frank Furness, architect. Victorian house museum at 1048 Washington Street. Beach tags are required in order to use Cape May beaches. Cape May has become known both for its Victorian gingerbread homes and its cultural offerings. The town hosts the Cape May Jazz Festival, the Cape May Music Festival and the Cape May, New Jersey Film Festival. Cape May Stage, an Equity theater founded in 1988, performs at the Robert Shackleton Playhouse on the corner of Bank and Lafayette Streets. East Lynne Theater Company, an Equity professional company specializing in American classics and world premieres, has its mainstage season from June–December and March, with school residencies throughout the year. 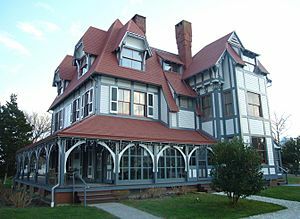 Cape May is home to the Mid-Atlantic Center for the Arts & Humanities (MAC), established in 1970 by volunteers who succeeded in saving the 1879 Emlen Physick Estate from demolition. MAC offers a wide variety of tours, activities and events throughout the year for residents and visitors and operates three Cape May area historic sites—the 1879 Emlen Physick Estate, the Cape May Lighthouse and the World War II Lookout Tower. The Center for Community Arts (CCA) offers African American history tours of Cape May, arts programs for young people and is transforming the historic Franklin Street School, constructed in 1928 to house African-American students in a segregated school, into a Community Cultural Center. Cape May is the home of the so-called "Cape May Diamonds". They show up at Sunset Beach and other beaches in the area. These are in fact clear quartz pebbles that wash down from the Delaware River. They begin as prismatic quartz (including the color sub-varieties such as Smoky Quartz and Amethyst) in the quartz veins alongside the Delaware River that get eroded out of the host rock and wash down 200 miles to the shore. Collecting Cape May diamonds is a popular pastime and many tourist shops sell them polished or even as faceted stones. The Cape May area is also world-famous for the observation of migrating birds, especially in the fall. With over 400 bird species having been recorded in this area by hundreds of local birders, Cape May is arguably the top bird-watching area in the entire Northeastern United States. The Cape May Bird Observatory is based nearby at Cape May Point. Cape May is also a destination for marine mammal watching. Several species of whales and dolphins can be seen in the waters of the Delaware Bay and Atlantic Ocean, many within 10 miles (16 km) of land, due to the confluence of fresh and saltwater that make for a nutrient rich area for marine life. Whale and dolphin watching cruises are a year-round attraction in Cape May, part of an ecotourism / agritourism industry that generated $450 million in revenue in the county, the most of any in the state. The Cape May Fisherman's Memorial, at Baltimore and Missouri Avenues, was erected in 1988. It consists of a circular plaza reminiscent of a giant compass, a granite statue of a mother and two small children looking out to Harbor Cove, and a granite monument listing the names of 75 local fishermen who died at sea. The names begin with Andrew Jeffers, who died in 1893, and include the six people who died in March 2009 with the sinking of the scalloping boat Lady Mary. The granite statue was designed by Heather Baird with Jerry Lynch. The memorial is maintained by the City of Cape May and administered by the Friends of the Cape May Fisherman's Memorial. Visitors often leave a stone or seashell on the statue's base in tribute to the fishermen. As of May 2010[update], the city had a total of 31.63 miles (50.90 km) of roadways, of which 24.99 miles (40.22 km) were maintained by the municipality and 6.64 miles (10.69 km) by Cape May County. Route 109 leads into Cape May from the north and provides access to the southern terminus of the Garden State Parkway along with US 9 in neighboring Lower Township. US 9 leads to the Cape May-Lewes Ferry, which heads across the Delaware Bay to Lewes, Delaware. NJ Transit provides service to Philadelphia on the 313 and 315 routes and to Atlantic City on the 552 route, with seasonal service to Philadelphia on the 316 route and to the Port Authority Bus Terminal in Midtown Manhattan on the 319 route. The Delaware River and Bay Authority operates a shuttle bus in the summer months which connects the Cape May Transportation Center with the Cape May-Lewes Ferry terminal. The city is served by rail from the Cape May City Rail Terminal, offering excursion train service on the Cape May Seashore Lines from the terminal located at the intersection of Lafayette Street and Elmira Street. The United States Coast Guard Training Center Cape May, New Jersey is the nation's only Coast Guard Recruit Training Center. In 1924, the U.S. Coast Guard occupied the base and established air facilities for planes used in support of United States Customs Service efforts. During the Prohibition era, several cutters were assigned to Cape May to foil rumrunners operating off the New Jersey coast. After Prohibition, the Coast Guard all but abandoned Cape May leaving a small air/sea rescue contingent. For a short period of time (1929–1934), part of the base was used as a civilian airport. With the advent of World War II, a larger airstrip was constructed and the United States Navy returned to train aircraft carrier pilots. The over the water approach simulated carrier landings at sea. The Coast Guard also increased its Cape May forces for coastal patrol, anti-submarine warfare, air/sea rescue and buoy service. In 1946, the Navy relinquished the base to the Coast Guard. In 1948, all entry level training on the East Coast was moved to the U.S. Coast Guard Recruit Receiving Station in Cape May. The Coast Guard consolidated all recruit training functions in Cape May in 1982. Currently over 350 military and civilian personnel and their dependents are attached to Training Center Cape May. Cape May is the subject of the song "On the Way to Cape May", originally sung by Cozy Morley. The 1980s horror film The Prowler was filmed entirely on location in Cape May, as was the 1981 film Graduation Day. The town lends its name to the Cape May Cafe, a restaurant in the Beach Club Resort at Walt Disney World. The 19th episode of season 3 of NBC's The Blacklist features Cape May. Cape May, New Jersey Facts for Kids. Kiddle Encyclopedia.